Z Lot, pay for parking in same building, street parking. It's time for some foodertainment and real-world funning that is beyond the beyond. 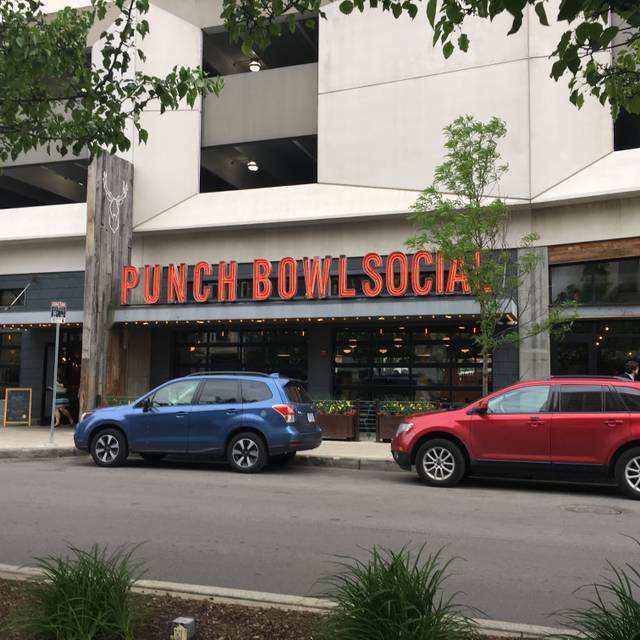 At Punch Bowl Social, we're all about experiences- from the artisanal punches, micro-beers and craft non-alcoholic beverages to the food fit for foodies and endless new school and old school gaming options. And we’re bringing it to you in a gorgeous design-forward atmosphere that’ll make you want to stay and play forever. We’ve been awarded more than a dozen national and local awards so come check us out at Punchbowlsocial.com. Here’s to going out right. Join us for our Mother's Day Brunch! We are offering an all you can eat kids buffet, 3 seasonal specials from our scratch kitchen, and free play on our arcade games so mom can enjoy a "Mom"-mosa from our build your own mimosa bar while everyone plays! The music volume is really loud in the dining area. Could be turned down over there. Service was very slow, despite having reservations. Had a great time at Easter Brunch - the Bloody Mary Bar was awesome! I love the vibe of this place – super urban and decorated very cute. We visited for brunch after a bachelorette weekend and the entire party said they wanted to come back to Detroit to just come to Punch Bowl. The biscuits and gravy were phenomenal and the chicken and waffles were delicious as well. The service was great and friendly. Drinks were Great! Green Chorizo Fries and Sriracha Peanut Fries were great! (They are meal on its own). Carnitas tacos were good. Chicken sandwich was ok. The chicken and waffles was disappointing. 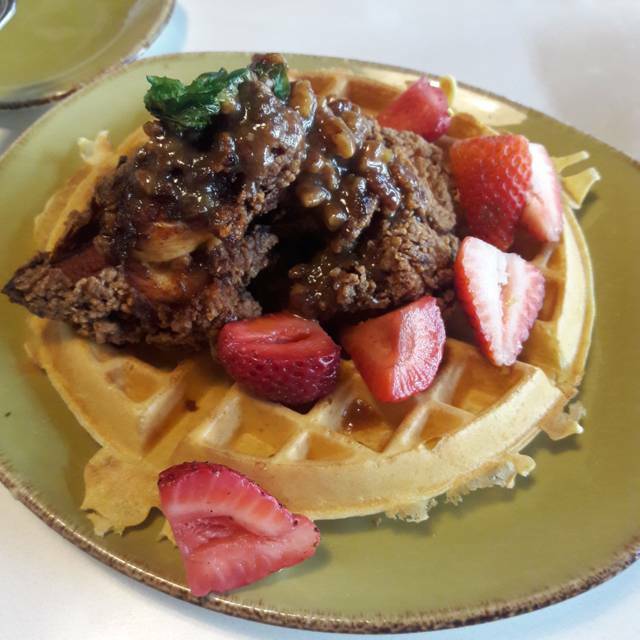 The chicken was over fried, the waffle was over made that it had a burnt taste and there wasn’t enough of the Chipotle-Citrus Maple Syrup. I don’t know if this is their norm or they were just off that night. May try the place out once more before making a final decision about the place. We were so happy with our experience. We came to celebrate my fiancé’s birthday. Our server was amazing! The atmosphere was great! It’s a really unique, cool place. The decor was awesome! The menu was unique, and delicious might I add. It was our first time there, and it definitely won’t be our last. Thank you for making his birthday a memorable one, he can’t stop talking about his burger, and “those” biscuits. 5 Star Worthy for sure! I love the atmosphere!! The service was excellent from the moment we arrived. 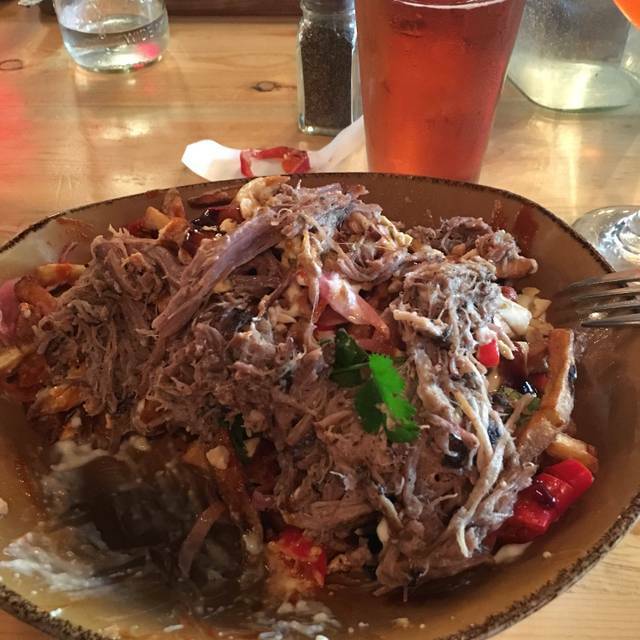 Food is definitely not for those on a diet, but it was delicious. We especially enjoyed the Sheet Load of Nachos!! Great food and service and the perfect spot for a pre-concert dinner! It was our first time to PBS. Service and food were very good. Lots of well-priced, fun activities for adults and kids. The only reason I gave 4 stars is because the whole upstairs was closed for a private event so we weren’t able to do a lot of the activities my kids were looking forward to (ping pong, corn hole, life size Jenga). We’ll try it again some other time... would definitely be a fun place for a larger group too. We absolutely loved everything about this place and we will be back!! Fun vibe and atmosphere... know what you're going for - to have fun! Food was only ok.. Very small portions. Food quality was mediocre. Service was extremely slow and unattentive! We eat out alot, and this was by far the worst experience we've had in years. Came in for a bite before a concert at LCA (a Wednesday around 6:30). Made reservations ahead of time on open table and was seated right away. 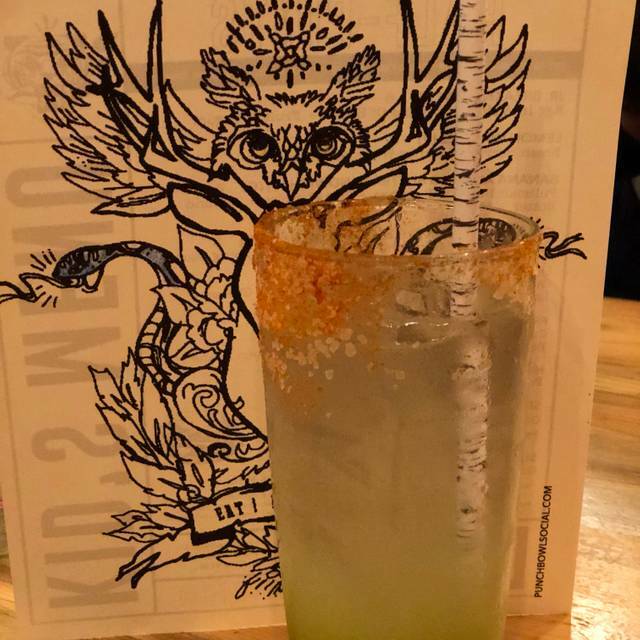 Had the Met-Man’s World punch - a lovey blend of bourbon pineapple and lime. Boozy without being too sweet. So good I had 4 - definitely the highlight of the night. Had the spiced edamame and chorizo fries to start - both were good but didn’t blow my socks off, and both were in need of salt. Finished off with the pork belly tacos - flavorful but didn’t hit the top 10 list of things I’ve ever eaten. Service was a little slow to start (waited a solid 15 minutes for our first drinks) but things picked up from there. Our waiter was enthusiastic and attentive. I’d definitely come back and give the rest of the menu a try. Great food, atmosphere, and drinks, but service was slow for a busy night. It was a bizarre experience really. We came in at 12:30 on a Sunday and it wasn’t busy. Even in spite of all the open tables we were sat in the back next to the kitchen where it was noisy. It took 3 times to get one of our food orders correctly (it was tacos with no cheese/no onion). Also 3 of us had a canned beer and they were all warm. The food was good but everything else was less than stellar. terrible! We schedule a table for 11 people on here and got there and they said they cant do reservations over 6 on here! So we did not have a table! I had 11 people meet in Detroit with no where to go! What a terrible experience. Great atmosphere! Great drinks! Lots of activities and things to do. We had enjoyed the brunch and went back later in the night for some drinks. Would definitely recommend! Food and drinks were horrible, staff was not good. Games??? What games, they had bowling that was about it. Our server, Wayne, took very good care of our 7 person table. All is the staff were engaging and helpful. We had some technical difficulties with a bowling lane but the staff, again, were very accommodating to make the beat of the situation. Great energy! Fun place to hang out before a show. Limited menu but hey, it’s kind of a bar scene. 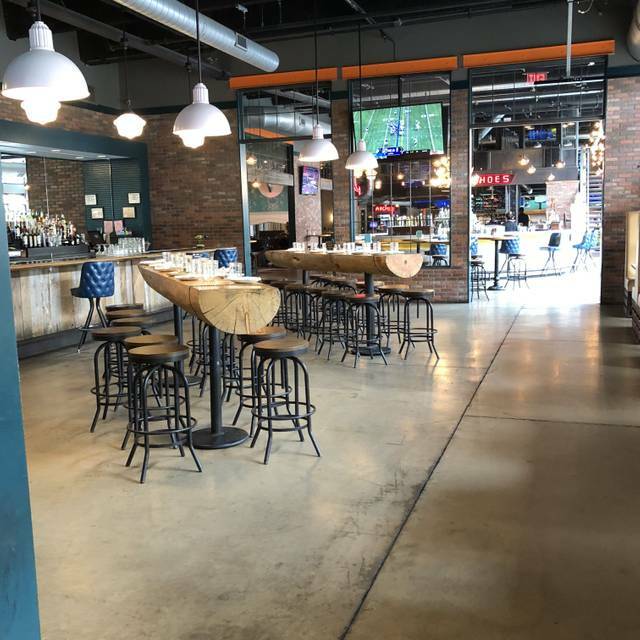 Great spot for a bite and drink before the game! Shanice is a fantastic manager! The food was fantastic. Our first and last time there. Food was horrible. The place was dirty and our waitress was not nice. Do not waste your time or money there. McDonald’s has better food!! My tables waitress was not the best. I understand that it as a Saturday night and all but we only had our waitress come up to our table 3 - 4 times throughout our entire time being seated. Drinks took atleast 20 - 30 mins to get to our table. 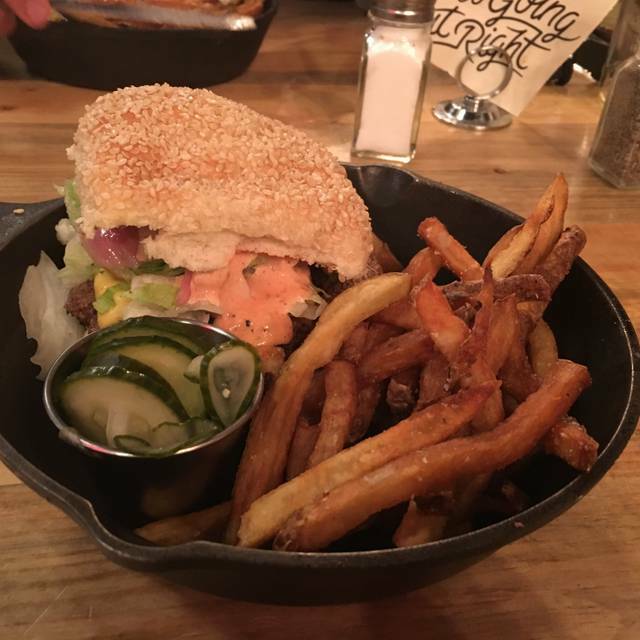 I ordered a burger with TOMATO, and asked for ranch with my fries. When my food arrived my fries were cold, I had to ask for my ranch, and there was no tomato on my burger. I would have said something to the waitress but I didn't fee like waiting another half an hour to get warm food/correct items. Overall, I wasn't happy. Great service, nice pace between drinks, app and dinner. Staff is so friendly. Love the menu, just creative enough without being too weird. Big place, so on the noisier side, not for a quaint or romantic meal. I was really disappointed. The atmosphere and vibe are cool. The green chorizo fries are delicious. The duck confit huevos was soooooooooooooooooooo salty & sent it back and didn't get anything else. And I'm the type who salts everything. Wouldn't go back. $16 for a breakfast that was inedible. The food wasn’t that great. The peanut fries were soggy and not as described. The atmosphere was nice and service fabulous. I might go again but wouldn’t recommend it to others. Raymond was a fantastic server. Everything exceeded our expectations! It was terrible..food didn’t have taste..what’s the point of making reservations if you can just walk in and sit anywhere..service was terrible..
None of the beers on tap were available the entire 2 hours we spent there. Disappointing! I really do like Punch Bowl, I just think it’s over priced for what it is. Great atmosphere! The food was AMAZING! AND the adult cocktails were fun and creative! Love it, we will definitely be coming back! We went to for brunch on a Saturday morning at approx. 10 a.m. We skipped the hotel breakfast as the menu at Punch bowl looked great. We were the only guests on the dinning side w/what looked like a lot of cooking staff standing around. The music was so loud we could not hear our waitress. We asked to be moved to quieter table or that the music be turned down. Waitress seemed offended about this, but the music was turned down to a manageable level. I hope the waitress was new as she did not know a lot about the menu or even the company. They have an extensive cocktail list, which includes non-alcoholic drinks plus fresh juice, which was great. We ordered coffee w/Irish creme and a couple of juices. It took about 10 minutes for the coffee and 15 for the juices. Remember we were the only ones on this side of the restaurant. There was an issue with the juicer (I could see them working on it) so it was understandable that it took a while to get the juices. Wife had Mushroom Biscuits 'N' Gravy and I had scrambled eggs, bacon, & potato crisps. They also provided two biscuits w/strawberry jam. The biscuits were not completly done and were doughy on the inside. 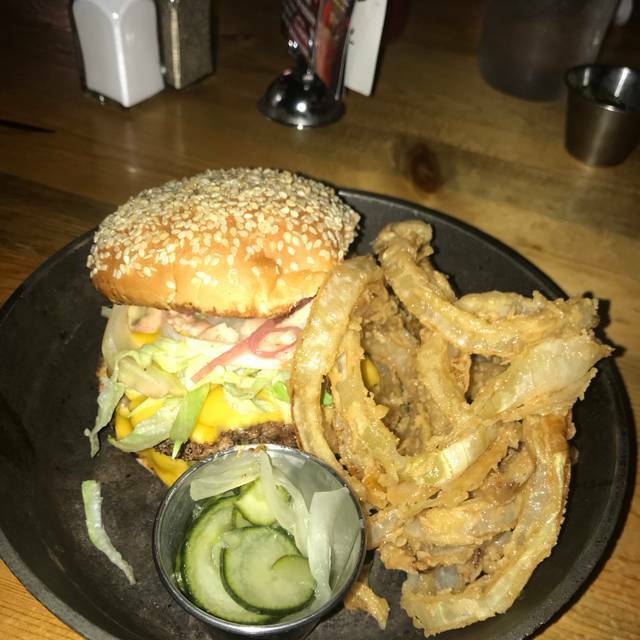 Wife liked her meal except for the fact it was very greasy. Mine was also very greasy. I ended up using my napkin to remove grease from the bacon so that it was edible. I love bacon, so this was the first time I think I have ever done that even at home. Overall food/service was not worth the money. We will probably try dinner at some point and hopefully it will be better. However, I would skip Brunch/breakfast. Drinks were very good. 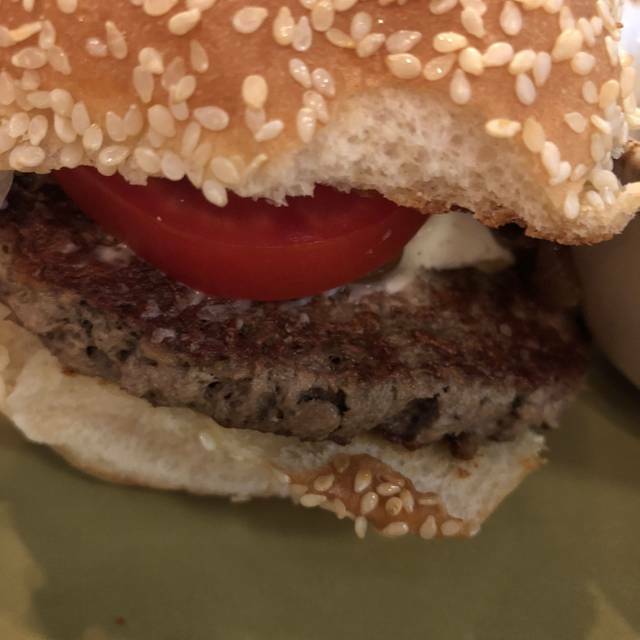 The impossible burger was overcooked. The fries are mediocre. The chicken and waffles were not very good, though the sauce that came with them was good. Maybe it needed more sauce. Our server was not good. We saw our food sitting in the window for a very long time before it came to our table. Date night dinner before the Opera was great. The food was amazing, the lobster bacon fries were A+, and the Chicken N' Waffles were incredible. Whoever thought that jalapenos, pecans, and maple syrup go together should win a prize. We didn't check out the bowling or arcade area, but it looked like a great time, and considering how good the drinks were as well it's no doubt a great spot to hang out with friends. I would highly recommend, and I'll definitely be back!